While the Philadelphia Phillies-backed soccer team was losing its third straight game to the Baltimore Orioles soccer team on October 27, 1894, one week after of the collapse of the American League of Professional Football Players (ALPF), which was backed by member clubs of baseball’s National League, Philadelphia’s other professional soccer club, the undefeated Philadelphia team of the American Association of Professional Football Clubs (AAPF), met amateur side Philadelphia Athletic, the champions of the city’s first organized soccer league, the Pennsylvania Association Football Union (PAFU), at Stenton Park in Wayne Junction. It was something of a cakewalk for the Philadelphia Association team with center forward Carmichael scoring a hat trick, and inside right Suddell a brace, in the 7-0 win. When the ALPF had collapsed on October 20, the league’s officers had announced that players were to be paid through the end of the month. Arthur Irwin, the manager of both the Phillies baseball and soccer teams, said he planned to organize another Philadelphia team after that. On November 1, the Philadelphia Inquirer reported that “After a great deal of dickering and badgering,” Irwin had finally accepted a challenge issued several weeks before by Clement Beecroft — manager of the Philadelphia team of the AAPF, the professional league of which he was also president — to play a game to determine which of the two professional teams “is entitled to the title of champions of Philadelphia.” The Philadelphia Times reported the same day, “Manager Irwin has made a substantial wager that he has the best team, which Manager Beecroft accepted, and the game will no doubt be for blood as well as coin.” Unfortunately, as of this writing, I can find no record of the match or even confirm that it happened. No doubt Beecroft’s Philadelphia team would have destroyed Irwin’s Phillies. Just about every other team the Phillies faced had. On May 22, 1897, Philadelphia and Paterson would meet again in the deciding game of the American Cup final. Manager Beecroft, of the Philadelphia Association Foot-Ball Team, received a telegram from Manager Huston, of the Princeton University eleven yesterday, accepting his offer for a game in this city next Saturday afternoon. This will be the event of the season in local association foot-ball circles, as when the crack Tiger eleven meets the champion Philadelphias a fine game is assured. The game had originally been scheduled to take place at the University of Pennsylvania, but the Inquirer reported on November 21 that it had been moved to Wayne Junction “on account of the carpenters being at work erecting new stands for the Thanksgiving game” of American football between Penn and Harvard on November 29. As we have seen, Princeton had a long football history and in the late 1860s and early 1870s had favored soccer-style football over rugby-style football. But with Harvard refusing to play anything but rugby-style football, Princeton dropped soccer-style play in 1876. 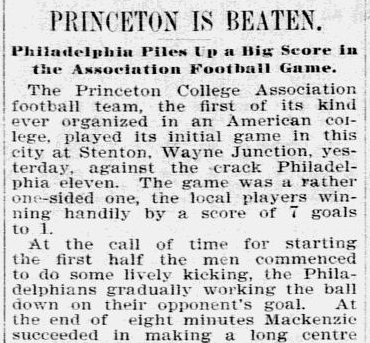 While the Inquirer and Times reports are clear that the Philadelphia Association’s opponent came from Princeton University, an article in December 11, 1895 issue of the Alumni Princetonian suggests the opponent actually came from Princeton Theological Seminary. The article reports of a game against the professional Kearny Rangers team that took place on December 7, 1895, “This is the second game the Seminary team has played with professionals, the game with the Philadelphia team being lost by the score of 6 goals to 1.” Sometimes, research turns up more questions than answers. Local newspaper accounts of games not involving Beecroft’s team during this period are rare and it is evident that, while no official announcement had been published, the PAFU, the city’s first organized soccer league, seems to have folded. Matches that occurred were now one-off affairs such as the Christmas Day meeting between the Jefferson and Celtic teams at Washington Park, which finished in a 1-1 draw. The AAPF, America’s second professional league also seems to have quietly folded. Research into this forgotten league is just beginning so little is known about it. Perhaps it was less a league in a truly organized sense than a reaction to the formation of the APLF, a kind of handshake arrangement by organizers in the leading centers of soccer on the East Coast to stake a claim in the professional game before the ALPF dominated the game. With the collapse of the ALPF only two weeks after its first game, the impetus for maintaining the AAPF may have disappeared and these same organizers may have reverted to their previous custom of arranging inter-city contests between leading clubs, particularly on holidays such as Thanksgiving, Christmas, and New Year’s Day, to maximize both interest in the games and gate receipts. With the end of the AAPF, Beecroft’s Philadelphia Association team became the John A. Manz team in 1895. The team was named after its sponsor, the treasurer of the Philadelphia Brewing Company, which was located at 6th and Clearfield Streets (the 1895 Philadelphia City Directory lists him as living at 3124 North 15th street and his occupation as brewer). 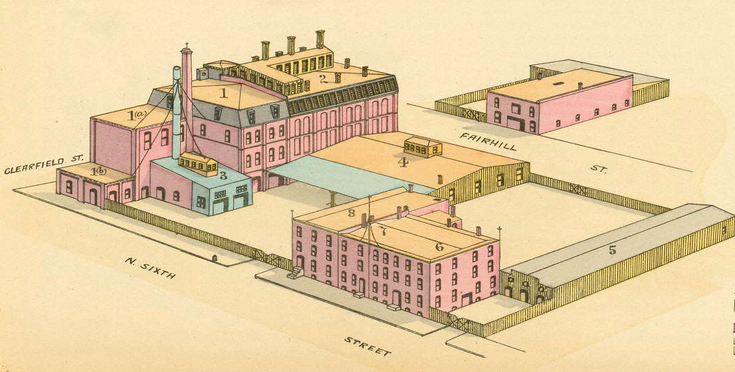 The brewery had been founded by his father in 1864 as the Gottlieb Manz Brewery, being renamed the Bavaria Brewery in 1873, and then Gottlieb Manz Brewing Company in 1887, before becoming the Philadelphia Brewing Company in 1893, the name under which the brewery operated — save during Prohibition when it was the Philadelphia Beverage Company — until it closed in 1949. 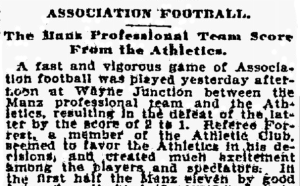 Newspaper reports from the 1890s indicate that a Manz Athletic Association also backed basketball and baseball teams. The Philadelphia Brewing Company. From the 1889 Hexamer General Surveys, Volume 24. 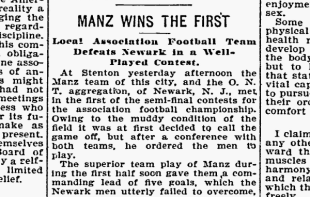 The Manz team opened the 1895-96 season against the Athletics, described in the Inquirer’s match report on Oct. 26 as the “champion amateurs of the state.” Manz was the 2-0 winner. Manz continued to play local amateur sides through the fall of 1895, including the Tacony and the Lehigh teams, as well as playing the Athletics again, winning each game. When within about ten minutes of stopping time, Steele, by a clever kick, shot the ball under the bar, scoring the first goal for the Manz team. In less than two minutes afterwards, MacDonald of the Newark eleven, sent the ball flying through the upright posts, securing a goal for his side. The game finished as a 1-1 draw, setting up a rematch in Philadelphia on December 26. Before that game, Manz faced Tacony and Lehigh again, defeating Tacony 4-0 on December 7, and Lehigh 2-1 on December 14. The Inquirer match report for the win over Lehigh noted, “The Manz team had three new players, among the number being Leftman, who has taken part in international matches between England and Ireland, both in Rugby and Association contests.” Unfortunately, the report does not mention if Leftman played for England or Ireland, nor is a first name provided. In the event, I have been unable to locate a Leftman in international player databases for England or Ireland in either sport. 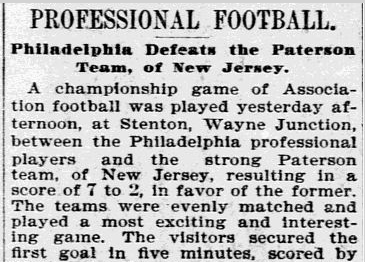 On Christmas Day, 1895, a Philadelphia Old Timers team faced Athletic, and the Vincent team faced Albion at Stenton Field in Wayne Junction, with Athletic emerging the 2-1 winners, and the other game ending in a scoreless draw. 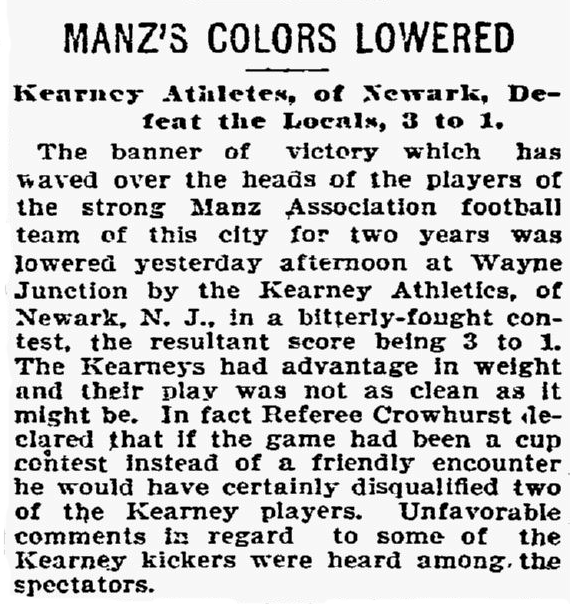 Manz hosted Newark Scottish-Americans at Germantown Ball Park in the re-match to decide the championship of the two cities in front of “a large number of spectators,” winning 3-2. It was a good end to a good year, marred only by the loss to American Cup-holders Newark Caledonians. Most importantly for the Manz team and their place in local and US soccer history was a letter team received by Manz manager Theodore Mackenzie received dated December 15. 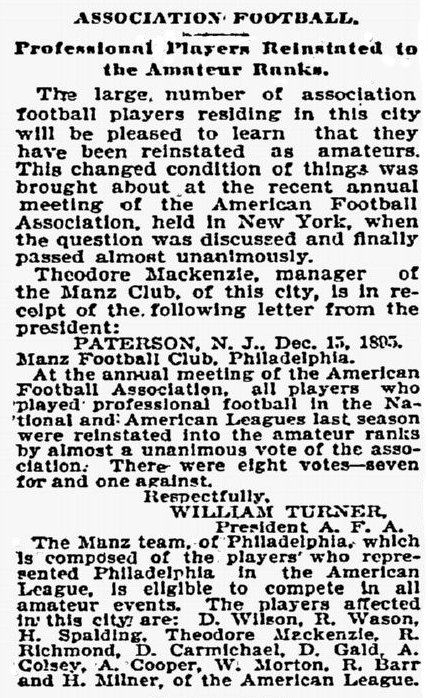 At its annual board meeting in New York, the AFA had voted unanimously that “all players who played professional football in the National and American Leagues last season were reinstated into the amateur ranks.” Twelve players on the Manz team saw the return of their amateur status. This was of vital importance for now the team was eligible to enter into the AFA-sponsored American Cup competition, which was restricted to amateurs. The training would prove to be not enough. The Kearneys [sic] had advantage in weight and their play was not as clean as it might be. In fact Referee Crowhurst declared that if the game had been a cup contest instead of a friendly encounter he would have certainly disqualified two of the Kearney [sic] players. Manz would lose to a Philadelphia team for the first time a month and a half later when Alma defeated them on a snowy day on February, 13, 1897, 1–0. It was the only one of four games scheduled for that day that was played, the Inquirer reporting on February 14, “the snow having rendered the grounds unfit for sport.” It was, and would remain, a common problem for winter soccer in Philadelphia. Suffering two losses in little over a month, the first losses in the history of the team, was surely disappointing. But by now, it’s focus was squarely on becoming the first Philadelphia soccer club to win the American Cup. As was discussed earlier in this series, the American Cup tournament, backed by the American Football Association, had been first staged in 1885. Since then teams from Northern New Jersey, Massachusetts, and Rhode Island had won the open challenge format tournament which, at this time, was only open to amateur teams. While the tournament would never include teams from farther west than Philadelphia, it was until the creation of the National Challenge Cup, better known today as the US Open Cup, the closest thing to a national championship for soccer in the US. With the AFA reinstating the amateur status of players who had been a part of Beecroft’s Philadelphia Association team in December of 1895, it was too late for its successor Manz to enter the American Cup tournament for the 1895-1896 edition. But, in the fall of 1896, Manz did enter, meeting the 1895 champions Newark Caledonians, the first team to have ever defeated them, in the first round in Newark on October 31. Interestingly, the AFA had changed the format of the 1896-1897 tournament from the familiar home-and-home format to a three-game series for each round. 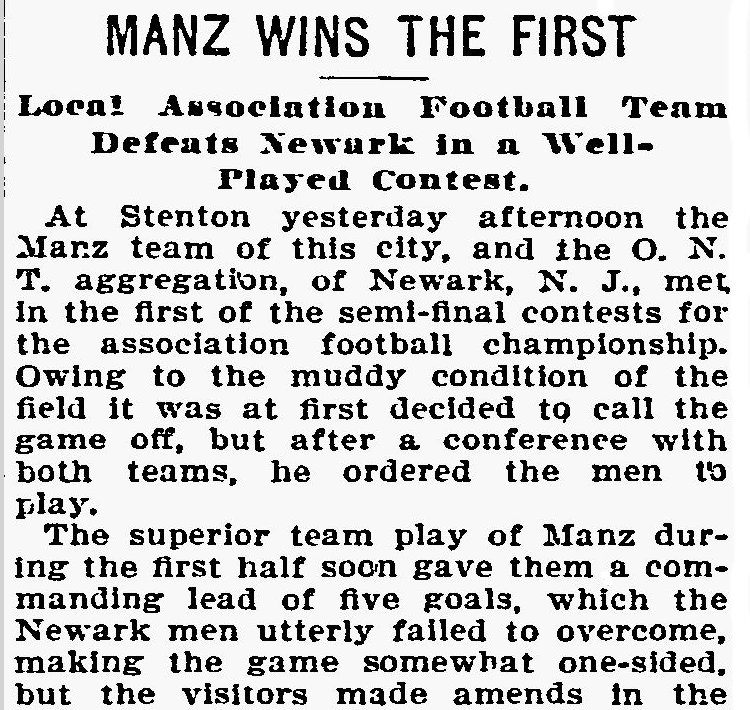 Whether Manz was burning to avenge its first-ever loss, or the Caledonians had fallen some distance in terms of quality since their 1895 American Cup championship, Manz returned home victorious, pounding the Newark team in a 7-0 win in the opening game of the first round series on October 31. A return match in Philadelphia was scheduled for November 7, but “the Caleys” forfeited, and so Manz progressed to the second round after playing only one game. With the Caledonians forfeit, Manz instead faced that day local side Albion. The Inquirer described on November 8 that “Lovers of Association football were loud in their praise yesterday afternoon over the very creditable and scientific playing of the Albions.” Manz won, 7-0. Because an odd number of teams — nine in total — had entered the 1896-97 American Cup tournament, a draw was held to determine which of the first round winners would face the Scottish Americans, who had a first round bye. Kearny Athletics was drawn to face them, which meant that Manz advanced to the semifinals to face O.N.T. after just one first round game. The superior team play of Manz during the first half soon gave them a commanding lead of five goals, which the Newark men utterly failed to overcome, making the game somewhat one-sided, but the visitors made amends in the second half, showing surprisingly good form and equaled the work done by the local men in that period. The slippery ground spoiled many fine plays, and luck was certainly with the local men. On February 6, the teams met in Newark for the second game. Again, weather was a factor, with a report in The Amateur Athlete on February 11 describing “A stiff breeze” and rain “pouring down in torrents” at kickoff. At the final whistle, Manz was again the 6-1 winner. This will undoubtedly be the greatest game of foot-ball ever played in this city. These teams are the strongest in the United States. It will be the first final game ever played in Philadelphia for the American championship and, considering that this is the first season the Manz team has entered the competition, they have indeed proved themselves to be worthy exponents of this great outdoor sport. Manz won, 4–2, with center forward Steele scoring two goals. At Willard Park in Paterson on May 3, the True Blues were the 3-1 winner to force a third game, which was played in Newark on May 8. Level at 1-1 after regulation time — Manz equalized in the first half when a stone thrown from the crowd struck a True Blues defender, who then missed a clearance — both teams scored in extra time to finish at 2-2. The play for the first fifteen minutes of the first half was the finest ever seen on the grounds. Finally Turner, the Blue’s full back, secured the ball and with a long shot straight down the field scored the first goal. Almost immediately after the line-up Weason of the Manz team duplicated Turner’s pretty play and scored for the visitors. The half ended with the score one goal each. With twenty minutes play remaining in the second half the Blues scored on some fine dribbling and a well directed shot by Turner. The Manz team then cut loose and scored four goals in quick succession, the game ending with the score 5 goals to 2 in favor of the Philadelphians. Manz had won Philadelphia’s first national soccer championship with an aggregate score over four games of 12-9. As had been the case when the Philadelphia and Paterson AAPF teams met in 1894, Manz had come come from behind in the deciding game of the championship to equalize after Paterson scored first, conceded another goal before equalizing again, and then ran away with the game with a barrage of goals for an emphatic victory. The American Cup tournament would be suspended between 1899 and 1906. A Philadelphia team would not win the tournament again until 1910. Dave Gould, coach of the US at the 1934 World Cup, played for Manz. Thanks for the great article! Curiously, this publication referred to the Cup contest of that year being a 4 game affair.